Oil on canvas, 38 x 53 cm. For Rørbye’s contemporaries, Jutland was as exotic as Rome or the Far East. The artist went to Jutland several times and was one of the first Danish painters to discover the unique qualities of Skagen. 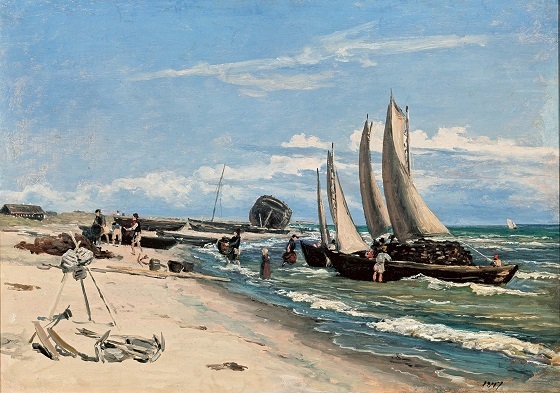 On a warm and windy summer day, Rørbye has painted the fishers on the beach in Skagen, as they unload peat from ships. His uses a liberated painting method with wide and brushstrokes, which suggests that it is a sketch. The composition is summary and some figures and elements are just barely suggested with a single blotch of paint. It is the totality of beach, wind, light and air that have interested Rørbye, and he in this way anticipates the characteristics of Skagen painting a whole generation before it became a concept.